The United States' East Coast features an array of varied beach destinations easily reached by car or plane. Along the Atlantic Ocean from Virginia to Georgia, the options range from big-time beach cities such as Virginia Beach, Va., and Myrtle Beach, S.C., to smaller towns with nearby beaches such as Wilmington, N.C.; Charleston, S.C.; and Savannah, Ga. Of course, there also classic and quiet island getaways like those found in the Outer Banks and Crystal Coast of North Carolina and Hilton Head Island off South Carolina. With 14 miles of public beaches to fit any mood, Virginia Beach is better than ever on and off the famed strand's sand. The heart of the resort area features the bustling three-mile paved boardwalk, street performers, live music, diverse festivals, outdoor cafes, restaurants, and nightlife. To the south, Sandbridge offers a quieter atmosphere and beach. To the north, Chesapeake Beach (known to locals as Chick's Beach) features the protected shallow waters of the Chesapeake Bay. Inland, attractions include 18,000 acres of state parks and national wildlife refuges, Cape Henry Memorial, the Old Coast Guard Station, the Military Aviation Museum, the Atlantic Wildfowl Heritage Museum, and the Virginia Aquarium & Marine Science Center. Those looking for a truly unique Atlantic Coast experience should head north to the small beach town of Cape Charles on the Chesapeake Bay, as well as famed Chincoteague Island. Made up of four islands stretching 130 miles along North Carolina's northeast coastline, the Outer Banks feature some of the most remote tracts of undeveloped beaches anywhere in the country--but they're still easily accessible by car via a network of highways, bridges, and ferries. Those with four-wheel drive vehicles can even drive on many miles of accessible beaches. Outer Banks activities can include sunbathing, nature excursions, kiteboarding, hang gliding, fishing, golf, scuba diving, and much more. There's also the Wright Brothers National Memorial marking the brothers' manned 1903 flight; Cape Hatteras Lighthouse; the North Carolina Aquarium on Roanoke Island (one of three along the state's coastline) near charming Manteo; and The Lost Colony, a drama performed outdoors since 1937. Known as North Carolina's Southern Outer Banks, the Crystal Coast features 85 miles of gleaming beaches stretching from Cape Lookout. Highlights of a visit include the quiet Cape Lookout National Seashore (with its famed ferry, lighthouse, and 56 miles of protected beaches); the wild horses of Shackleford Banks; Fort Macon State Park; the North Carolina Maritime Museum; and the North Carolina Aquarium at Pine Knoll Shores. The gems of the Crystal Coast are Atlantic Beach, Emerald Isle, Harker's Island, Morehead City, and quaint Beaufort. Fishing and other watersports are popular, as is enjoying fresh catches at local restaurants. With a truthful tagline of "Historic Riverfront & Island Beaches," the Cape Fear riverfront town of Wilmington and diverse beach destinations of Wrightsville Beach, Carolina Beach, and Kure Beach provide a perfect coastal catch. It starts with historic downtown Wilmington, where there's the USS North Carolina battleship, vintage and boutique shopping, and varied dining. Out on the nearby beaches, Wrightsville is known for surfing, stand up paddling and nature tours, while Carolina Beach features a classic boardwalk and a huge fishing fleet. Kure Beach has a new oceanfront park, the North Carolina Aquarium at Fort Fisher, and the Fort Fisher Historic Site. 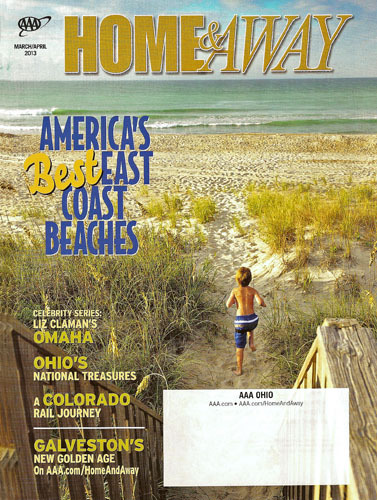 Celebrating its 75th anniversary in 2013, Myrtle Beach is bigger and better than ever. Downtown's beachfront revitalization continues on and beyond the new 1.2-mile Boardwalk and Promenade, which runs between two piers. The towering 18-story Myrtle Beach SkyWheel, dining, shopping, and entertainment are highlights. The entire Grand Strand area, which includes options north and south of Myrtle Beach proper as well, actually encompasses 60-plus miles of beaches. Beyond the beach, area draws include world-class golf, miniature golf, Huntington Beach State Park, Brookgreen Gardens, quiet Pawleys Island, and Murrells Inlet, South Carolina's seafood capital. Charming Charleston remains one of the southeast's favorite destinations, but many may not know the Holy City is quite close to varied beaches. Sitting right at the mouth of Charleston Harbor across from historic downtown, Sullivan's Island is a welcoming seaside destination connected by bridge to the nearby town of Mount Pleasant. Also in the area are Shem Creek seafood restaurants, and Patriots Point Naval & Maritime Museum (home to the USS Yorktown and more). To the northeast of Sullivan's Island, Isle of Palms offers golf, boating, and more great beaches. Just 15 minutes from downtown, funky Folly Beach is a favorite with locals and veteran visitors. Just a bit further, both Kiawah Island and Seabrook Island offer miles of quiet beachfront, golf courses, and more. Nearby Edisto Island is another beach lover possibility. With more than 12 miles of broad beaches, world-famous golf, an oft-photographed lighthouse, and many other vacation activities, Hilton Head Island remains a popular beach destination decades after initial development. Utilizing forward-thinking development techniques and offering environmentally-oriented attractions and activities long before green development and travel were trendy, the island is thriving. Highlights on and near the island include the Coastal Discovery Museum, red-and-white Harbor Town Lighthouse, varied nature tours on water and land (including popular new zipline tours). Peaceful Pinckney Island Wildlife Refuge and the quaint riverfront town of Bluffton are just off Hilton Head Island proper. Like Charleston, historic Savannah remains a very popular coastal destination with a very southern accent. Savannah's beach, Tybee Island, just 20 minutes from downtown and well worth a visit--and stay. From kayaking to birding, outdoor activities are tops on tiny 2.7-square-mile Tybee (and nearby uninhabited Little Tybee Island). Visitors can also enjoy the Tybee Island Lighthouse, historic Fort Pulaski National Monument and Tybee Island Marine Science Center. For more information, maps, TrikTik routes and TourBook guides, contact a local AAA Travel agent or visit AAA.com/travel.